Perhaps Romney surrogate John Sununu ought to rethink the placement of that Obama/Biden bumper sticker, after all. 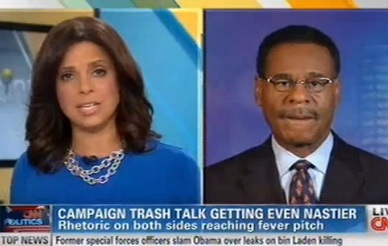 But the supposedly “biased” Soledad O’Brien wasn’t taking the President’s word for it Thursday morning, pressing Rep. Cleaver on the meaning behind Biden’s words. Cleaver told O’Brien that he didn’t give the line a second thought when he first heard it. Whether or not you agree with the comparisons that Soledad O’Brien makes here, this interview i clearly not the work of a biased journalist, as right-wing whining suggests, but of a journalist who applies her own well-formed judgments fairly and evenly. O’Brien has done a lot of reporting and commentary on issues of race, and here, she deployed her expertise on the subject to conduct a tough, thorough interview. A fair interpretation of Joe Biden’s comments (and the one I made) is that he ad-libbed that line as a way to complete his Wall Street metaphor, while also reminding the audience (even the white people, who, believe it or not, also care about social justice) that Republicans haven’t exactly been friendly to black people, or the first black president. Even if you buy into the notion that Republican policies are better for everyone, including black people, their consistent demonization and exploitation of racial resentment can fairly be seen to outweigh that consideration. In context, it was a clumsy non sequitur, and a trivialization of slavery, but what folks who ask what would happen if Romney made a similar remark don’t get is that Joe Biden and the modern Democratic Party have earned some benefit of the doubt that Republicans, particularly Mitt Romney, have not. If Biden owes anyone an apology, it certainly isn’t the people who are most loudly campaigning for one.